The iMums wanted to share some of our Christmas and holiday themed app favorites with you. Below is a short summary of each of the apps along with links to our reviews as they have been completed. We hope that you will enjoy these apps as much as we have with our families. Many of these are ones we load onto our devices year after year to enjoy – and some stay on all year round! In our family, we pick a new holiday themed book to read every night – these are some of our digital favorites among The Mums. Come visit us at The iMums for more great tech and app reviews! Looking for more great app reviews – check out this page on Bluebee Pals. Reading with our kids is one of the favorite things to do with our iKids. A Charlie Brown Christmas + iMessage Sticker Pack! – Loud Crow Interactive Inc.
Christmas morning. Among their presents is a Nutcracker Bear which Papa reminds them is from The Nutcracker ballet they saw on TV. At first, the cubs weren’t too interested in it, choosing instead to play with their new toys. It didn’t take very long for the cubs to get bored. With plenty of time before dinner, Papa suggests they entertain themselves by using their imagination. The cubs think this is a splendid idea and soon find themselves lost in the world of The Nutcracker. Read Fides review. Merry Christmas Mom and Dad- Little Critter by Oceanhouse Media, Little Critter attempts to make Christmas special for his Mom and Dad. He tries different things such as making cookies, picking out a Christmas tree, and wrapping presents, but each time the results are not quite what he was hoping for. Even though Little Critter messes up at everything he tries, you can’t help but fall in love with him. He is charming and funny as he explains what he did and what happened when he did it. My kid and I really enjoyed this story. Read our review. Santa’s Suit is Missing! – Ginger Whale Pty. Ltd.
Five Little Monkeys Christmas by Loeschware is a Christmas themed app featuring my favorite little Monkeys! The app features an an interactive counting game with a musical touch based upon the popular nursery rhyme. This app helps toddlers and preschoolers practice early literacy skills with word highlighting, repetition, addition and subtraction practicing early math skills and of course lots of fun. The app features three different musical scores including, “rock”, “country” and “pop”. This is perfect to work on counting, expressive and receptive language as well as a fun way to learn! The Witch and the Christmas Spirit is by SlimCricket is a brand new app for iOS. The Witch is getting read for a Halloween adventure when her friend Peepo the Elf calls and says that a terrible illness has spread across the North Pole. He asks the Witch to come and help Save Christmas! Will they be able to? Enjoy this Free app with IAP that includes games, 3D pages and more! Reading Train Christmas Books, Songs & Games by The Learning Station is a leveled reading app containing 30 different Christmas stories. I loved sharing these Christmas stories with my sons and helping them read at the same time! This post was originally made on The iMums in 2015 at http://bit.ly/1IK2fRo. It is republished with permission. 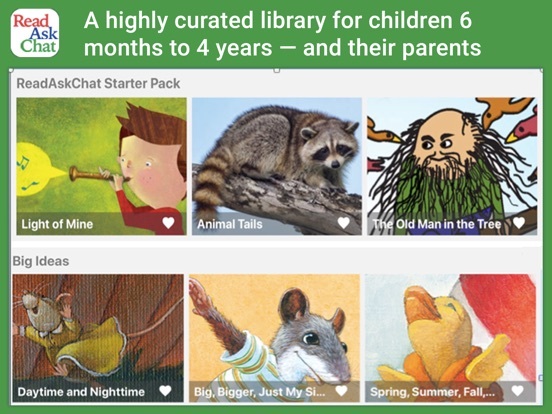 ReadAskChat is a curated library of stories designed for children from six months to age 4. The stories feature bright artwork, text and parental cues to help parents read with their children. I still remember the first time I sat in the rocker with my then infant son and held a black and white board book to read with him. I felt unprepared because I wasn’t sure how I was supposed to read with him or help him learn. You can read our interview with co-founders Alice and Carolyn to learn more about the reasons on why ReadAskChat was created. You can also read a paper about the science behind ReadAskChat. This app takes it beyond your device or tablet and encourages interactive reading using conversation starters to help kids engage and learn. Key concepts in the app include rhyming, patterning, early academics like colors, shapes, early sight words along with math and science concepts. I loved the wide variety of content that was included in the app and that my son was engaged and learning from stories – which we could look at no matter where we were at a point in time. I actually found myself reading more with my son because I could pull out my iPhone or tablet while we were waiting for appointments or had short periods of downtime. He loved tapping on the screen to show me what he was seeing – and I liked hearing what he saw in the photos and engaged. Both of us became more engaged with stories – rather than him sitting in my lap passively to hear a story. In addition, I recently read to my son’s classroom and used ReadAskChat along with a software which was able to reflect my screen onto a whiteboard so that the group of kids could participate. Although the app is designed for more 1:1 or 1:2 use it was fun to use in a class because it encouraged open-ended conversations and allowed kids to really engage with the story. As kids get bigger you can encourage them to help swipe and actively pick out sight words, look at the images within the stories and pick out specific details or even find an object or color within the image. With my son as we read the stories and he’s become more familiar – we now sometimes play “I spy” to see the details that we might have previously missed. One of the other things that I really enjoyed was the conversation starters to help me encourage my son to better engage with the story. Another feature I liked was the “swipe lock” which made it so my son couldn’t accidentally move forward beyond pages that I wanted him to be on. The app also lets you favorite stories using a heart at the bottom – my son quickly learned about this and we picked out his favorites and then we were able to scan for the hearts when picking a bedtime story. I also really liked the descriptive words used within the app to tell a story which tied to the picture. Words like “slip and glide” for my son were new – so we actually practiced them by sliding our feet on the rug. Introducing tech to your baby and toddler can mean different things to different people. I used several white noise apps with my son before he turned one, or would play music via my device for him. One he turned one and a half, we started letting him use apps for very short time periods (5-10 minutes) to try out apps on our device. It is important, especially with younger children to use guided access and to be present while they are using your device. Guided access allows you to use a fingerprint or a passcode to temporarily restrict your iOS device to a single app, disable selected areas of the screen that are not relevant to what you are doing as well as disable hardware buttons like the sound switch and the home button.